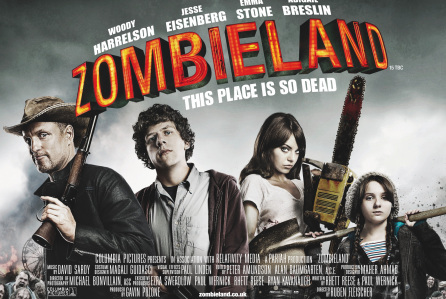 “Zombieland” was a completely wacky film right from the get-go and extremely entertaining throughout, never once really losing my interest. It focuses on a character that goes by Columbus, played by Jesse Eisenberg, who is very careful and has a very long list of rules he follows in order to stay safe during the apocalypse. He is all about staying away from anyone and anything, wandering alone as the movie starts. But, over the course of the film, this changes, and he is forced to learn how to care for and protect people other than himself. The movie is a fairly gory one, fair warning, and there were points that I regretted choosing to watch while eating pasta, but I powered through for this article. Much of the graphic violence in the film is all about the spectacle of it, as well as the occasional humor of showing interesting ways for the protagonists to take out zombies, which I will not spoil. Most of the gore is fairly simple, not too realistic, and thankfully not so horribly gross so those weak of constitution would be entirely unable to watch it. Another unique part of the film is that the characters do not refer to each other as their real names. Instead, they choose to refer to each other as the city they are from, such as Columbus, Tallahassee, and so forth. It adds an interesting lens to the whole thing and really speaks to the overall theme of the movie: trust. It intrigued me that they all chose to represent themselves with where they come from, and let that speak to who they were as a person. It gave their real names so much power, that should they choose to reveal what their real name was, it really meant something, and that was a pretty cool feeling. Most surprising of all was how real the movie could get at points. This was the thing that caught me off guard the most about it. Here was this goofy, ridiculous zombie movie where one character’s goal is to eat some Twinkies before they go bad, and it hits you at some parts with a real dose of genuine emotion that you never would have expected. Overall, the movie has great characters, a wacky enough plot that the entertainment value stops you from worrying about, and just enough levity that you can connect and empathize with the characters when it matters. I can definitely recommend this film to anyone who enjoys a good comedy and can handle the gore of, say, the Walking Dead.